If you work with a nonprofit, you might also want to check out our top five social fundraising tools, which help organizations raise more money by making the process social. The following tools all have social sharing capabilities as well. You want to raise money — say, medical expenses for a loved one, tuition costs for someone around the globe — but chances are you’re not sure how to go about doing it. While you could use PayPal to raise money by integrating it into a website or through email — and many of the following sites rely on PayPal for donations — these eight tools will give you a more attractive and more engaging platform; one that has a better chance of raising the money and awareness you need. 1YouCaring is a free fundraising website created specifically for individuals wanting to raise funds for personal causes. More than 16,000 fundraisers have been held to date. Most tools charge some type of fee, but not this one. The site is supported entirely by donors. How do they achieve this? When people donate to a fundraiser, they have an option to donate a percentage of their total to YouCaring. The only money taken out (about 2.9 percent of the total plus 30 cents) will be from credit card processors PayPal and WePay (expected to be available this month). Money is sent instantly (in most cases) to the fundraiser’s account as soon as it’s donated, so you won’t have to wait until the end of the campaign to get your money. For campaigns, the site has seven categories: medical expenses, memorials and funerals, tuition assistance, adoption fundraising, funding for mission trips, helping a neighbor and more. A thank-you message (personalized by you) is automatically sent to your donors. Pictures and videos (only from YouTube currently) can be added to pages. Good social integration: Facebook, Twitter, Google Plus, Pinterest and email. Allows anyone to comment on the page. Page creator can make updates. Campaigns are promoted to the front page. Also, projects are promoted through Twitter and on their Facebook page. Offers fundraising tips and a blog. The site is secure: All donations are processed using Secure Socket Layer encryption, or SSL. No way to embed a widget on another site. Pages have a big YouCaring banner at the top. 2GiveForward provides online fundraising pages for free. Their website says they are the No. 1 platform for medical fundraisers. Other options for pages include pet medical and funeral/memorial. Desiree Vargas Wrigley and Ethan Austin created the site in early 2008 to allow anyone to raise money for anything. They have had more than 25,000 individual fundraisers published on their site and have helped people raise more than $27 million. A fundraising page is free to create, and at the end of the fundraiser, GiveForward deducts 7 percent for processing fees. However, donors now have the option to cover the processing fee for their individual contribution. Also, PayPal deducts 2.9 percent of the total plus 30 cents. Creators get the money when the fundraiser reaches its end date, and the maximum time for fundraisers is four months. Users get their own personal fundraising coach, who will helps users reach their goals and answers any questions they may have. Photos and videos can be added to pages. Anyone can grab a widget to help promote the fundraiser. Anyone can send “hugs” or comments. Anyone can get updates on the project using RSS. You get your money, even if the goal is not reached. The site offers fundraising tips on its blog. The site is secure: They use 128-bit SSL encryption. You can make your page private if you wish, meaning that it won’t show up in Google. The fundraising goal and amount raised is generally small. The overall design of the page is a little cluttered. Social integration is adequate: Only Facebook and Twitter are included on the pages. Its website says it’s the most popular website for personal causes, and that it grew more than 500 percent from 2011 to 2012 (it launched in 2010). FastCo.Exist says its the third most successful crowdfunding platform after Kickstarter and Indiegogo. Personal donation campaigns. These type of projects receive money immediately after it’s donated, and there are no time limits or collection requirements. Charity fundraising campaigns. Money raised for charity is sent to the selected charity on a monthly basis. All donations are sent via check. All or nothing campaigns. Supporters are only charged if you reach your funding goal. Creating a page is free, but GoFundMe deducts a 5 percent fee from each donation you receive. Also, the site partners with FirstGiving, which deducts a 4.25 percent fee to process and deliver all donation payments to charities. Or for individuals, a 2.9 percent plus 30 cent fee per transaction is deducted by WePay or PayPal. Users can choose different colors for pages. The fundraising page does have a GoFundMe banner at the top, but it is small. The home page shows recent donations, which might encourage others to check out and donate to campaigns. The site promotes campaigns on its blog and social media. Offers a customizable widget and badge that anyone can embed on a website or blog. Good social integration: Facebook, Twitter, Pinterest, Reddit and email. Creator can post updates, and each update has a donate button on the bottom of it. Each page has a printable sign, which anyone can use to help raise awareness and money. GoFundMe tries to answer all emails within five minutes. To protect donors and prevent misuse, a member of the GoFundMe team checks that the campaign creator has a valid Facebook account connected to their page, the page has a photo or video and the page has raised at least $100 in donations. After this, the page will be listed in the search directory. An email is sent to you each time someone donates to the page. People can set up recurring, monthly donations. The site is secure: They use SSL processing. Must have a Facebook account to show up in the site’s search. People must use Facebook to make comments on the page. Most of the messages explaining what the campaign is about get shortened, and people must click the more button to keep reading. 4Fundraise.com is a social fundraising platform founded in 2011 for raising money for personal causes or for raising funds for nonprofits or other organizations. The site also offers pages and support for events, including ticket sales, donations and Salesforce integration. Users can choose to receive their donations on a monthly basis or in one lump sum at the end of the campaign. Money is sent by check or by electronic fund transfer to the user’s bank account. A page is free to create, but a 4.5 percent fee plus credit-card processing costs are charged to each donation. Good, clean design of the campaign pages, with large, horizontal images. The tour of the pages’ features is helpful and well designed. The pages do have a Fundraise.com banner at the top, but it is very small. Good social integration: Facebook, Twitter and Google Plus. Users get a dashboard with analytics to see how their campaign is doing. Offers an email center, allowing users to send thank-you messages and reach out to hundreds of donors at the same time. Offers users a one-line code to embed the donate form on a website. The site promotes some campaigns on its blog. 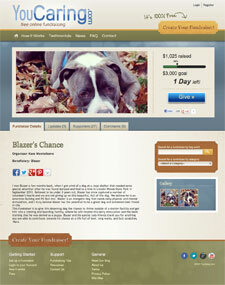 They also feature campaigns on their homepage and show recent fundraising activity on the homepage, too. Pages are mobile-optimized, and users have access to a free iPhone app. Donors can choose from $25, $50, $100 or another amount. Allows people to make recurring donations. Pages don’t have a place for campaign updates. People can’t comment on the pages. People can only donate with a credit card or debit card, not using PayPal. 5Many nonprofits use Razoo to raise money, but individuals can also create fundraising pages to raise money for nonprofits. Nearly one million officially vetted nonprofits are registered on the site. More than 300,000 people have used the site to support their favorite causes. Pages are free to create, but the Razoo Foundation, a nonprofit itself, deducts 2.9 percent, or 4.9 percent after April 1, 2013. Funds are given to the nonprofits once a month. Recurring and anonymous donations available. Good social integration: Facebook, Twitter, Google Plus and email. Small Razoo banner on the top of all pages. A free iPhone app is available. A Facebook widget allows you to embed the fundraiser on a Facebook page. Has an embed code for putting a widget on your blog or website. The homepage features campaigns and shows recent donations. Anyone can leave comments on a page. All donations are tax deductible, and donors instantly receive a tax-deductible receipt. The site is secure: They use SSL encryption. Can only donate with a credit or debit card, not using PayPal. The goal and amount raised on the pages are small. 6FirstGiving allows nonprofits and individuals to create fundraising pages. The website has been around for 10 years, and more than 8,000 nonprofits have used it to raise more than $1 billion. Pages are free to create, but FirstGiving deducts 7.5 percent service fee from all online donations. Also, donors have the option to pay this fee so that all money reaches the nonprofit. An embeddable widget is available to put on a website or blog. Good social integration: Facebook, Twitter, LinkedIn and email. A few causes are featured on the homepage. Site is secure: They have 256-bit SSL security. Design is a little cluttered and not as good as some of the other tools. Only donors can make comments on pages. 7Crowdrise provides online fundraising websites for individuals, nonprofits and event fundraising. People can create fundraising pages for their favorite causes. Basic. With this free plan, Crowdrise deducts a 5 percent fee plus a $1 fee on donations under $25 and a $2.50 fee on donations above $25. Featured. This plan costs $49 a month or $490 a year, and Crowdrise deducts a 4.95 percent fee plus $1 per donation. Royale. This plan costs $199 a month or $1,990 a year, and Crowdrise deducts a 4.95 percent fee and no transaction fee per donation. This plan also get custom, branded pages. To get their money, charities can choose to receive a lump sum check every 30 days or they can receive each donation in real-time. Good social integration: Facebook, Twitter, Pinterest and email. Visible “Donate” button and amount raised. Pages do have a Crowdrise banner at the top, but it’s small. Donations are tax deductible, and donors automatically receive email receipts. Users get Crowdrise Impact Points for raising money, donating to causes and getting votes. Crowdrise doesn’t promote causes very much. IndieGoGo charges a 9 percent fee on all funds raised, but if you reach your goal, you get 5 percent back. Also, nonprofits get a 25 percent reduction on platform fees. Campaign creators can keep all the money they raise, even if the goal is not reached. Or they can opt to keep the money only if the goal is reached. Creators who choose the first option will also have to pay a 3 percent credit-card processing fee, plus a $25 fee for non-US campaigns. Each page has a shortened, shareable link. Can provide donors with perks for donating certain amounts. Creators can provide updates on projects. Creators have a dashboard with analytics. Anyone can get an embed code to add a widget to a website, blog or email. Offer a blog with tips and other info. They say they respond to all emails in 24 hours or less. Donations can be accepted through PayPal or by credit or debit card. Indiegogo helps spread the word about campaigns through an algorithm they call the gogofactor. Sharing, tweeting and getting people to “like” your campaign will boost your campaign’s visibility. All pages have pink and green (IndieGoGo’s colors) on them. Pages must offer perks to donors. Create urgency. According to the GiveForward website, they’ve seen that the most successful fundraisers typically last four to six weeks, as people are more inclined to donate when there is a shorter time frame and a higher sense of urgency. Do something unique. You should have a little fun so that people want to reach out and give money to your campaign. The Crowdrise website suggest coloring your hair blue when you raise $500. Tell your friends and family. According to the GoFundMe website, personal campaign donations come mostly from friends and family, not strangers. Share and use social media. According to the Razoo website, shared fundraisers raise $18 more in donations, on average. What did we miss? Which individual fundraising tools have you used? Add your experience, feedback and suggestions in the comments section! I’ve found Payoneer to be a great way of collecting funds. You will get $25 (£17/€19) free when you sign up through this link!Get paid directly to your very own Payoneer Prepaid Debit MasterCard, available to over 200 countries worldwide! Another great fundraising company is BonfireFunds.com. They’re relatively new but have a lot of great features, particularly the fact that they don’t pass down any fees to the donor or to the person who creates a fundraiser. Money can be raised for anyone or anything via the sale of custom designed shirts. Bonfire actually helps the fund creator design his or her shirt for free, and doesn’t charge to start a fundraiser. It’s a cool concept (that works) and they have really good customer service.